What makes the best senior dog food? A little slower. A little snoozier. Possibly a little extra weight too. We’ll create a unique recipe of dry food for your senior dog. And it’ll adapt as they age, so they’ll always have the right nutrition to help with stiff joints, reduced exercise and even breed-specific issues and health conditions – including pancreatitis. Keeping them full of life, for life. 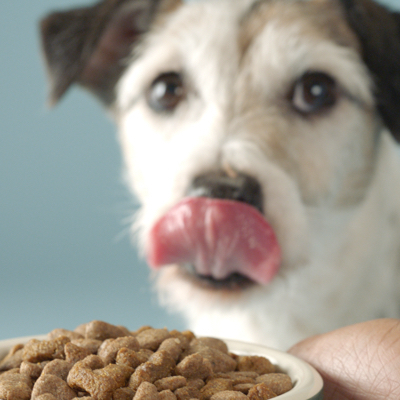 Some dog foods jump from ‘adult’ to ‘senior’ in a single bound – but ours doesn’t. Because it’s based on everything you tell us about your dog, their unique recipe develops as they do. Update their profile as their weight and activity levels change, and we’ll update their recipe with the right mix of ingredients for every stage of their life. We’ll add a smooth-joint megamix to their recipe, including glucosamine and chondroitin to help keep some bounce in their walk. Older dogs put on weight more easily as their metabolism slows down. We can help your dog maintain an ideal weight with a low-calorie, high-fibre recipe that’s as tasty as it is nutritious. As your dog gets older, expect fewer laps of the park and more naps after exercise. We lower the calories and fat in their food to match these lower energy levels. Senior dogs are more likely to get things like arthritis and pancreatitis. Tell us about any health conditions your dog has and we’ll make sure their recipe reflects their specific needs.